Helmand province witnessed a true sporting spectacular as British military personnel joined the people of Lashkar Gah to host their own version of the Olympic Games. 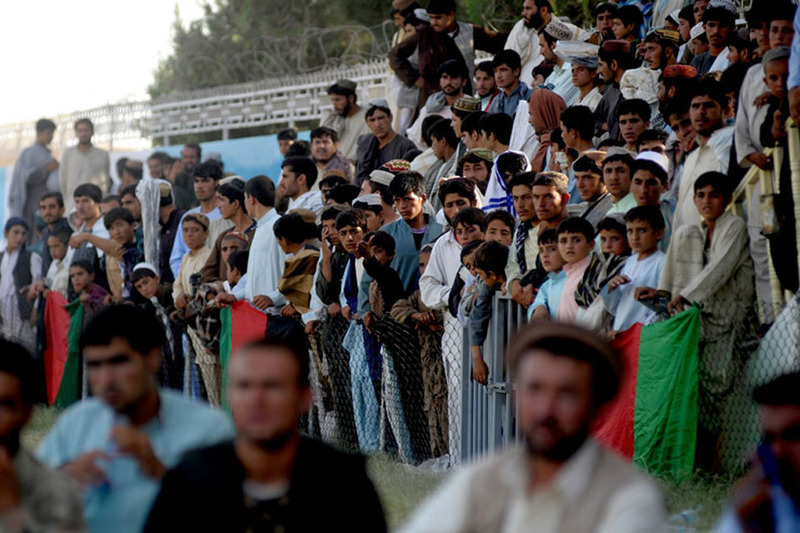 The ‘Helmand Olympics’ were held at the Karzai Stadium in Lashkar Gah. 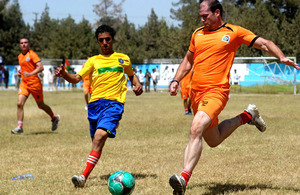 Teams representing the Afghan National Army and Police and the National Directorate of Security and British soldiers from 12 Mechanized Brigade all competed against one another in events including football, volleyball, basketball, a 100-metre sprint, Taekwondo, weightlifting, bodybuilding and, for the more cerebral, chess. The Afghan National Police topped the medal table with victories in the football, bodybuilding and the 100-metre sprint. The British team won the weightlifting while the Afghan National Army claimed the chess gold medal. The Karzai Stadium in downtown Lashkar Gah was built in 2009 and now hosts large-scale public events from football and cricket matches to pop concerts. The event was a huge success. We had teams from across the Afghan security forces competing, and everyone I spoke to has commented on how well it went. It is testament to the progress that has been made in Lashkar Gah that events like this can take place. We have provided very little assistance to the Afghans, everything from the opening ceremony to the security on the day has been planned and run by them. But we certainly got involved by joining in the competition and it has been great. The atmosphere here within the Karzai Stadium has been electric and I would like to thank my Afghan hosts for organising a superb event. It is testament to the confidence the Afghan security forces now have that they are able to manage an event such as this with ease. The obvious pride with which each competitor represented their respective team was there for all to see. We have all had a thoroughly enjoyable day. The Provincial Governor of Helmand, Gulab Mangal, opened the Games by welcoming all the competitors and the many hundreds of Afghan spectators of all ages who had come to support their teams. With the celebration of Peace Week in Helmand, I am really pleased that we were able to host a sporting event such as this here. Sport brings the world, countries, communities and people together and today’s Games send a message of peace and unity to all people around the world.